A fascinating soap opera of video format wars precedes us and one has to wonder why exactly Adobe's Flash format is not supported on the iPhone. Microsoft came out with an ad and PR campaign recently which focused on the excessive amount of money being spent on Apple products and services - they call this the "Apple Tax." The idea is you can get equivalent products from Microsoft at a fraction of the price. But Microsoft knows this isn't really a tax - they know their own OS initiatives have been a major challenge and that consumer perception of Vista is that it is a substandard OS. Windows 7 in fact is supposed to be the fix. Then there are ease of use issues which directly relate to decreased productivity. One of the most exciting parts of my job is to explore new technologies with my readers and attendees at live events. By now you probably know TMC produces the 4GWE conference in partnership with Crossfire Media -- a company where Carl Ford is an integral part of building a number of communications communities. If you aren't aware of Carl, he is a thought-leader in the telecom space having spent years developing leading edge content as part of the VON events of years past. The first 4GWE event we produced drew hundreds of attendees from around the globe and was extremely successful. We have collaborated and improved th conference quite a bit and in addition we have added a number of great new media partners and sponsors. I find myself reminiscing this morning as I devour a few articles about the history of computing. Both are filled with passion and make very good reading. Moreover there is a great deal of history in each and you can learn some valuable business lessons from each. The most passionate is an article from Jason Perlow explaining why he will never buy a Mac. Amazingly Perlow takes on Steve Jobs and calls him a snake oil salesman. A while back I headed out to Sardinia Italy to attend a media roundtable hosted by Tiscali International Network regarding the state and future of broadband technology. I do get invited to quite a few of these press/analyst events and this one really stood out in my mind due to the quality of the speakers and the location of the event itself. 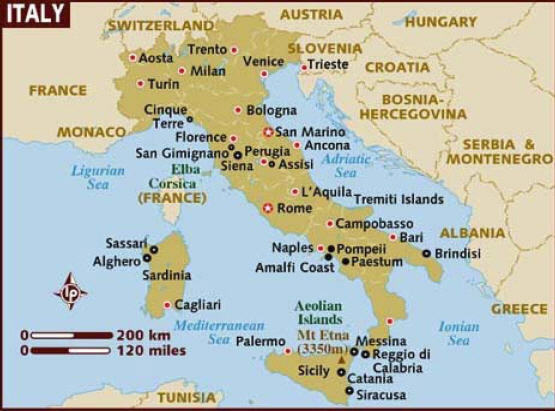 Sardinia is located in the middle of the Mediterranean and if you picture Italy as a boot kicking Sicily - a soccer ball, Sardinia would be located at the top of the kick. Can we Learn from the Nortel Fire Sale? As Ron Gruia pointed out this morning, the Nortel fire sale continues and a once-great company with a market cap of $250 billion is effectively being sold off at bargain-basement prices. In fact NSN picked up the ailing Canadian company's CDMA and LTE business for about one times revenue or $650 million. At this rate the entire company will be sold off for a total of $2 billion. You have no doubt noticed how traditional information technology vendors have embraced communications in response to customers who are looking for integrated and cost-effective solutions which span both markets. This thought occurred to me during a conversation with Mark Goodman, VP of Marketing for Ecessa a company focusing on "Uptime for IP networks," according to Goodman. Last year the company quietly changed its name from Astrocom and even if you haven't heard of either company it is worth looking at their products as they solve real-world corporate problems such as security through their ShieldLink family which takes the company's PowerLink line of load balancing WAN optimization controllers and adds VPN gateway and firewall capabilities. More recently the company announced ClariLink which takes ShieldLink and adds a SIP proxy, registrar and SBC allowing real-time failover for SIP sessions going over IP networks. If you ask Cisco publically what they think of IBM you will get nothing but praise. In fact Cisco counts IBM as a major partner and IBM does the same with Cisco. Oftentimes the companies even promote technologies like collaboration together. But more recently this alliance seems to be facing a challenge.